With temperatures dropping across the UK, drivers are waking up to frosty windscreens and icy roads. But millions of motorists are putting themselves and other road users at risk by ignoring safety advice and being underprepared, according to a research by uSwitch. Driving in cold weather can be particularly dangerous, with more than 2,170 accidents in winter conditions reported in 2015. Despite the extra risks, one in six drivers (16%) admit they don’t adapt their driving style in adverse weather conditions — that’s more than seven million drivers taking extra risks on the road. Over a quarter (26%) fail to reduce their speed when roads are icy, and 23% say they do not increase the distance between their car and the car in front — safety guidance that is included in the Highway Code. Many motorists also admit being unprepared for safe driving by not properly clearing their windscreen of ice or snow. Three in ten drivers (31%) in uSwitch’s survey said they don’t completely clear their windscreen before setting off, potentially causing dangerous blind spots. More than half (52%) fail to clear any ice or snow from their passenger windows. Many of those who do take the time to clear their windscreens are resorting to unusual methods in place of a traditional ice scraper. More than half (53%) admitted to using inappropriate objects to remove ice and snow, with 47% of those opting for a credit or debit card. 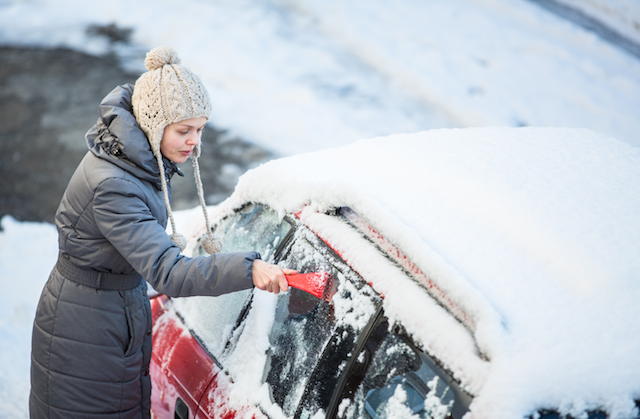 A third (33%) said they use their hands to clear their windscreen, while 13% reach for a CD as a makeshift scraper. Even more unusual objects used for ice removal include leaves (3%), mobile phones (3%) and even shoes (2%). More than one in ten (12%) admitted to using hot or boiling water to quickly clear their windscreen, which could weaken the cold glass and cause it to break. Some motorists try to avoid de-icing their car manually by taking a risky shortcut in the mornings. One in four drivers (25%) admit to leaving their car running unattended while it warms up on a cold winter morning. As well as proving tempting for thieves, this could invalidate an insurance policy as most providers will not pay out for a car stolen when the keys are left in the ignition unattended.